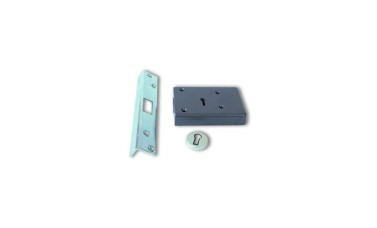 Supplied c/w 182mm extended strike plate and one escutcheon. Not reversible. Hand must be stated when ordering. Marston Fire Brigade Locks have been used by the London Fire Brigade for many years, normally used to secure doors to dry risers etc and normally specified in areas which the London Fire Brigade would require access. These locks are not sold with there keys, keys have to be ordered separately. 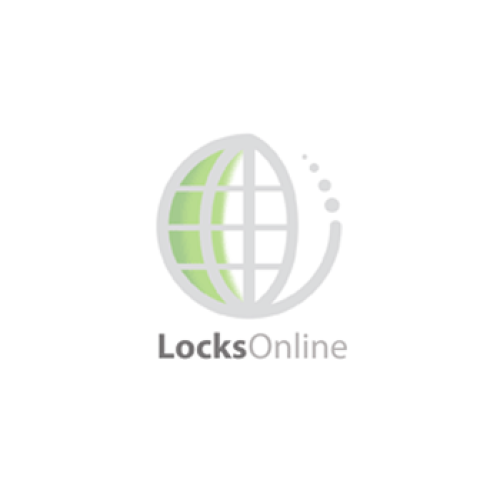 Hey guys, my name's Darrel, I'm head of the tech team here at LocksOnline.co.uk and today we have in front of us is a Fire Brigade lock, it's the rim lock, and it's made by Union. It used to be Marston but now it's badged under the Union brand. So, what do you use these for? These particular locks are used by the London Fire Brigade to secure dry risers or rooms, etc., that has sprinkler systems or anything, anything where the Fire Brigade need to gain access in the event of an emergency, or they need to gain access to get water or to get a pump or so forth to put a fire out. These particular type of locks, and there's a range of padlocks, etc., everything that is based around these Fire Brigade applications. Now it's very important that you be aware that if you're wanting to fit one of these you're fitting it because the Fire Brigade have asked you to fit it so they are for them, they would have a key in which to gain access. Now these locks are not supplied with keys and it's important for you to know about. They're not supplied with keys. Now, this particular lock comes in two different versions: it comes in a left-hand and it comes in a right-hand version. The one that I have in front of me here is the right-hand version but bear in mind that the video might make everything opposite so don't take that as being, 'Oh this is the way it's hinged or it swings.' because everything is in reverse in a video. But what you will notice there on the outside, or if you're thinking that you need to buy one of these, is the Fire Brigade may say to you, 'We want it to be on an FB1 key or these are available on an FB2 key.' Fire Brigade one, Fire Brigade two, simple as that. To know that you're getting the right one, it actually says on here, I don't know if you can zoom in there or not, it actually says there on this particular one here that this is an FB1. So an FB1 key as standard will fit this. This particular lock would sit then mortised, sorry, rimmed, screwed in on the back of the door. And the idea is then, you would drill a hole through and you'd drill a hole through the door and on the outside then you would have this escutcheon here, which comes in a little bag, and that would cover up the hole. So you put the key in and it allows you to throw the bolt back and forth. 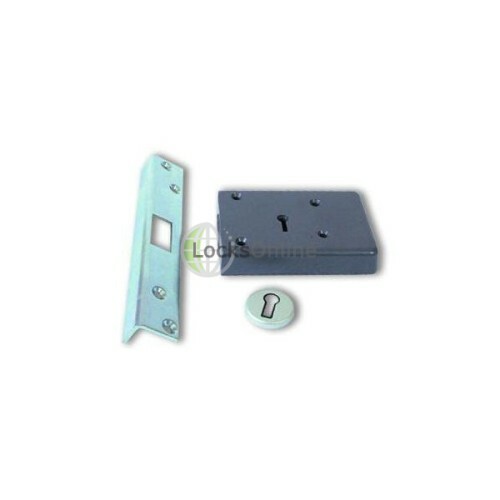 It also comes with a striking plate and quite a substantial striking plate as well to give you as much security as you possibly can when it comes to fitting this particular type of lock into the door. So without further ado, what I'll do is I'll get you some measurements. I mean, it comes with fixings as well, there's four fixing screws as standard. But let me get some measurements of this particular lock so then you can see whether or not it's suitable for your application. The oval case depth there is just a smidgin under 110, 109 millimetres. The backset which is from the faceplate to the centre of the keyhole there, that is a standard 45 millimetres. The fixing screws, let me get you some sort of idea as to where that end fixing screw is. That's 70 millimetres there to the centre and these here then from the centre is 15 millimetres. 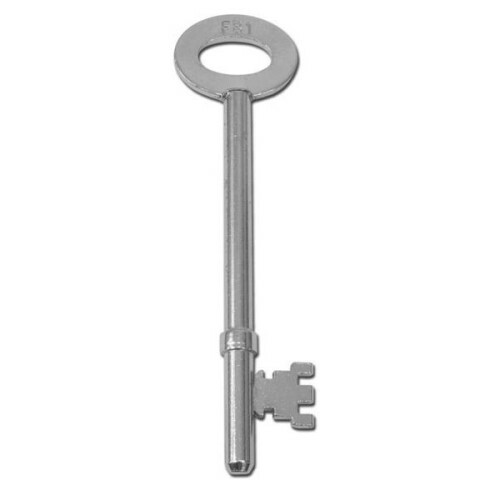 The depth or the thickness of the actual lock itself there, is round about 16 millimetres, so standard. So there you go guys, these are available on our website. There's a full range, they are handed, there's a left-handed version and a right-handed version, and they're also available to fit the FB1 key and the FB2 key. So I really hope that I've been able to give you a little bit more information than just a picture and a little bit of text will give you, in this video and I hope it will allow you to make an informed decision as to whether or not this lock is suitable for your application. But, hey, if you need any more information or you want a bit of advice or something like that, feel free to pick up the phone, we'd love to chat with you, or pop us an e-mail and we'll get back to you just as soon as we can. But in the meantime this is me, Darrel, thank you very much for your time and we'll catch up with you real soon. Take care now. Bye-bye.